It's been a long time (possibly 15 months!!) 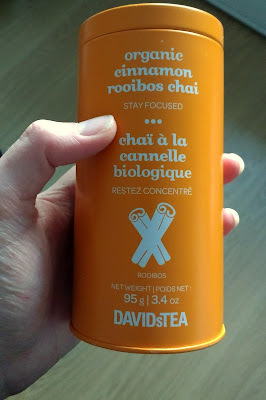 since I've done one of these 'loving' posts but I am in need of the positive focus this week. Between Trump's election and our household being ill with colds, life has felt a wee bit depressing. My body is clearly craving vitamin C and in the last few days I've demolished two punnets of blueberries and one of raspberries. Also most of a tin of pineapple! 2. The John Lewis Christmas ad. I'm not ready for Christmas, but since moving to the UK I have enjoyed discovering the phenomenon that is Christmas advertising here. Australia just doesn't have the same equivalent. The John Lewis one is always eagerly awaited and this year's didn't disappoint, even if it was less poignant than some of the previous I've seen. It's the time of year when a hot drink is never far from my mind, although with a baby, sometimes lukewarm (or microwaved) is a better description. Nonetheless, I'm enjoying them and their soothing effect on my throat. I'm especially enamored with this tea that was a gift from my brother, picked up on his travels before he reached us. 4. The combination of Mini Bite sleeping on me and books. With being ill, taking Mini Bite walking in her carrier has been more challenging, especially as my cough is irritated by the cold air and then prone to waking her up! Fortunately I have been able to settle her on me for some naps and then passed the time with a good book to hand. 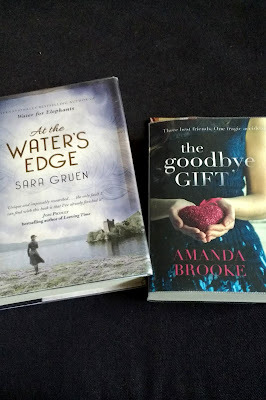 I've just finished Amanda Brooke's The Goodbye Gift; Sara Gruen's At The Water's Edge is next. What is not to love? This button hole kale excited me when I spotted it in Lidl. How nice to read a cheery post like this - sorry to hear you are ill but it is good to focus on a few good things - I've had some nice moments this week - a friend remembering to send me photos when I couldn't get to a school event, E helping out when I was sick and working through a problem at work that has been dogging me. Hope you make something nice with your purple kale (I'd fancy kale pesto) and your nice cups and tea with books and baby! Now I am off to check out the john lewis advert - the british ones are so much nicer than any here though they have improved locally. I'm sorry to hear you've been sick too. Hopefully the John Lewis advert cheered you up if you still needed cheering! I am loving reading about what you are loving this week. I hope that your nasty cough clears up soon. I will have to make my way down to Lidl this week for that purple kale. Yes what are we Brits like with our Christmas ads. I hope your GP appointment helps. My cough is most persistent!! I always love these posts that you write, its such a fabulous look at what products are available elsewhere. 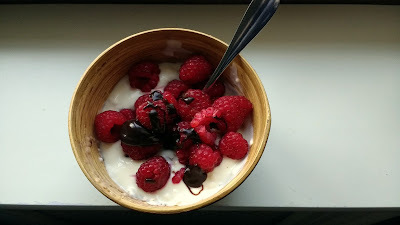 I love berries, I pretty much crave them all the time. I'm glad your able to enjoy reading while you are sick, I know being sick makes most things miserable. I hope you are feeling better by now. Ah! My husband just brought me home purple kale from the market. I'm in love! I did like the Sara Gruen book, a lot! I hope you like it too.